The American TFP > Events of 2006 > Morality Matters at Millersville Univ. Morality Matters at Millersville Univ. 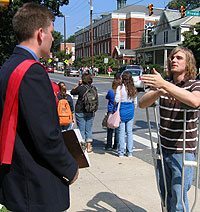 With customary capes, standard and bagpipes, TFP volunteers were able to manifest their disapproval of the moral wrong of abortion, giving students a persuasive flyer, “Ten Reason Why Abortion is Wrong,” and the opportunity to take an opinion poll. The event took place on September 18, when TFP Student Action members traveled to Millersville University near Lancaster, Penn. Reception varied between support and hostility. 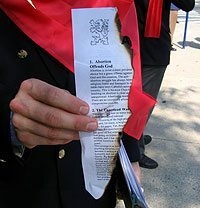 A “tolerant” woman parroting the tired phrase, “men can’t tell women what they can or can’t do with their bodies,” was so angry that she stopped on the sidewalk to burn a copy of the flyer. Others preferred to crumple the flyers up without even reading them, or pass by in herd-like fashion — totally indifferent. There were also reactions against abortion. One student said: “Thank you for standing up when no one else is.” Many others expressed similar thoughts. In response to the sign asking motorists to “honk against abortion,” there were a surprising number of honks in support. Over one thousand flyers were handed out to the student body throughout the day. Hopefully, the information will influence opinion and change minds. This entry was posted in Events of 2006 by Matthew Taylor. Bookmark the permalink.